Science surrounds you every day. Something as simple as boiling a pot of water is part of science. When you are trying to teach younger minds the fun and creativity that surrounds basic science, you have to compete with shorter attention spans. Creating easy science projects that younger children can participate in, but also learn from, is a way to combat that. This project is more suited for children in the third grade or higher. The project is an experiment on whether flowers grow better in cold or warm water. Gather several white carnations, water, food coloring and two glass jars or vases. Fill one vase with warm water and the other with cold water. Add the same amount of food coloring to each vase and then insert the flowers. The flowers will start to change to the color of the food coloring as they drink the water. Determine which flower drank more water by the vibrancy of the color. This project measures how much buoyancy is in salt water by seeing how much salt needs to be added to fresh water to get an egg to float. For this project you will need a tall glass, an egg and table salt. Ask the students to hypothesize how much salt they think it will take for the egg to float. Fill the glass ¾s of the way full with water and place the egg into the glass. Use a teaspoon measurement to slowly add salt to the glass and write down each time another teaspoon is added. Once the egg begins to float you have added enough salt to the water. Determine which student had the correct guess and help the class chart the results. Most children know that milk helps them grow strong and healthy bones. 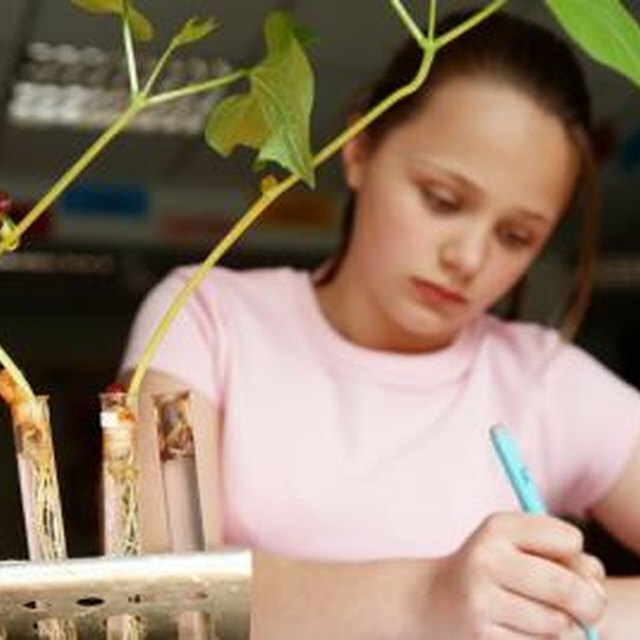 An experiment can also test whether or not milk helps plants grow too. For this project you will need milk, vinegar, juice, potting plants, potting soil, seeds, markers and labels. Fill three pots with potting soil and plant and equal amount of the same seeds in each one. Label each pot with the type of liquid it will be given such as juice, vinegar and milk. Place the plants in a sunny area together and give each plant the type of liquid it is assigned. Start measuring each plant as it begins to sprout over the period of a few weeks and record the findings. Use a measuring tape to monitor which plant is growing faster. The human body is equipped with a nose which assists in the sense of smell. This project focuses on how accurate the human body’s sense of smell is. You will need five containers with lids that you can poke holes into, labels, lemon juice, pine needles, coffee, vinegar, onion and a pen. Fill each container with a different smelling item and then label the underside with what it is. Cover each container with a lid. Have students come through and sniff each container and try to guess what it is. Record the results on a chart by how accurate the sense of smell is in determining what substance is in the container. Krow, Shailynn. "Cool Science Project Ideas for K-4th Grade." Sciencing, https://sciencing.com/cool-project-ideas-k4th-grade-8358218.html. 25 April 2017.